When it comes to direct marketing, nothing is more direct than a Door Hanger. Door Hangers get seen, they get held, and most importantly they get read. Make sure your message makes a positive impact by using a high-quality door hanger that is both sturdy and colorful. Standard sizes include 4.25” x 11 and 4.25" x 14", but Formax can print just about any size of door hanger you may need! Door Hangers are Simple. They don’t need envelopes, postage, folding, binding, or any other steps to prepare them for distribution. You can start going door-to-door the minute you receive them. Door Hangers get Seen. A door hanger suspends from the front entrance of a residence and the homeowner must remove it by hand. There is no possible way it can be overlooked. Door Hangers are Great for Targeted Marketing. Door hangers are ideal for reaching specific neighborhoods and communities. You can’t achieve a more targeted approach than physically placing a marketing message on someone’s front door. Door Hangers are Low Cost. 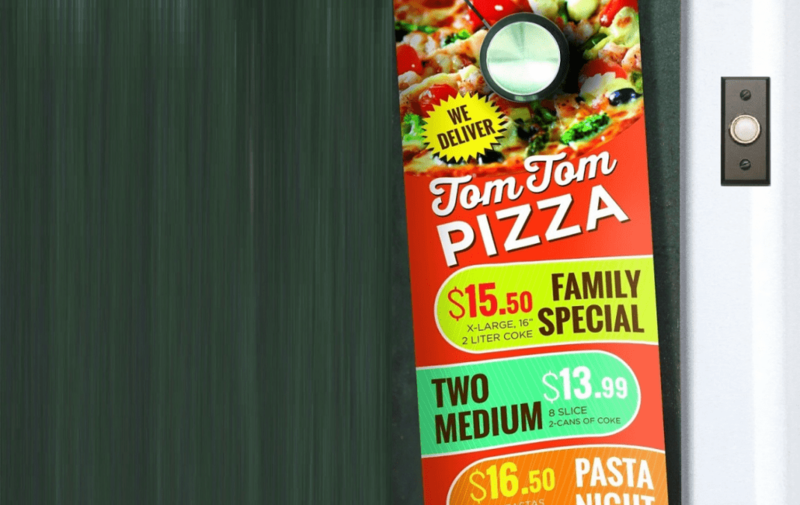 Because of their sheer simplicity, door hangers are one of the most affordable promotional methods available. They are not only inexpensive to print, they are also economical to distribute. Door Hangers are Customizable. Your door hanger can be printed with any layout or color scheme you desire. Need a custom size, special shape, gloss coating, perforation, business card slit, or other unique feature? No problem…the choice is completely yours. Door Hangers offer Timely Delivery. Door hangers are one of the few marketing methods that give you absolute control over when your message is delivered to potential customers. Door Hangers are Tangible. A door hanger exists in physical form. As such, it gets focused attention because the homeowner must remove it from the door handle, hold it, read it, and act upon it.